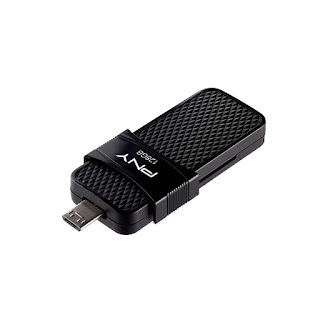 PNY Technologies (PNY) considered one of the worldwide leaders in consumer electronics market and flash memory products, has released the DUO LINK OTG Micro USB + Type-A 3.1 drive in India that offers lightning speed and easy transfer of all your files, images, and documents between your android smartphones, computer and electronic gadgets. The DUO LINK OTG Micro USB + Type-A 3.1 frees up all your storage space from your mobile phone and smoothly transfers all your digital media content to your PC or tablet. The DUO LINK OTG Micro USB + Type-A 3.1 comes in a high-quality durable plastic casing, with lightweight and portable dimensions that can easily fit into your pocket or handbag. The easy slide design function allows you to effortlessly switch between the Micro USB connector for android devices, while the Type-A 3.1 connector allows you to connect to any PC, tablet and even connects to your printer, so you can print out all your PDFs or documents on demand. Simply plug the Micro USB connector to your device, transfer your files, then slide the OTG to reveal the Type-A USB at the end to directly connect to your PC with quick and uninterrupted transfer speed of up to 130MB/s. The Micro USB 2.0 connector is compatible with all Android smartphones and tablets, while the USB Type-A 3.1 connector is compatible with all PC and Mac computers, laptops, and ultrabooks models. The DUO LINK OTG Micro USB + Type-A 3.1 is available in 32GB, 64GB and 128GB memory to suit your personal storage needs. The DUO LINK OTG is exclusively available on Paytm Mall India at an affordable price range. The DUO LINK OTG is also available in Type A 3.1 + Type-C 3.1 model with 32-128GB storage capacities. Visit www.pnytech.in for more information on the product.